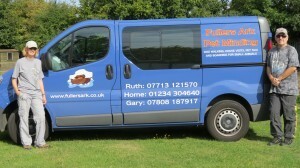 About Us Ruth & Gary Fuller welcomes you to Fullers Ark, as a pet carers we will look after your pet as if it is our own. If we go away, Our dog is most happy left in her own home and she is always very pleased to see us and very happy when we come home. Please feel free to have a look at our site and see what we can offer you, and feel free to contact us if you have a query. Also if we board a small animal you can feel free to come and view where they will stay. We are open all year round, if we are away we have reliable and trustworthy people covering for us. Hope to see you soon, Ruth & Gary Fuller if you cant get us at home please leave a message or try our mobile, also I always have access to e mail on my mobile. If a regular dog walk needs to cancel a walk, we need to know before 8:30am on the day as we normally have a very tight schedule, after 8:30am we have to charge for that day, if you need to cancel a holiday booking on the day there is a 50% charge the day before a 10% charge as we might have turned another customer down, the holiday cancellation is to our discretion. About Us... Based in Bedford, Fullers Ark offers quality Pet Services services in Bedford. Our friendly staff are available and ready to answer any questions you may have around your Pet Services needs. We are sure we can meet your needs, so telephone or e-mail now. Testimonials are curated by Fullers Ark and are not independently reviewed or verified. "I write to formally recommend Mrs Fuller in her professional capacity as dog walker, they have been responsible for my dogs on a regular basis for over 2 years and I have found them to be thoroughly reliable and more than able to cope with my boisterous two"
"This is to confirm that I have used the services of Fullers Ark for approximately 7 years, I have no hesitation in recommending them, I have found them to be honest, trustworthy and reliable." "Our Animals Were Being Well Looked After"
"I would like to thank you for the care you gave Ringo Gypsy and Jazz, whilst we were away, We had a wonderful time, made all the better knowing that our animals were being well looked after. It was also reassuring knowing that the house was made more secure by your visits and the little things, like turning on the lights etc." "It Is Such a Relief to Know They Are In Good Hands"
"I am delighted to recommend fullers ark, Ruth has taken care of my cats for the past year, when I am away often at short notice, it is such a relief to know they are in good hands, I hope I can find someone as efficient when I move to Hove"
"We have employed Fullers Ark to walk Merlin, our Japanese Akita, for over 10 years and find Ruth and Gary to be incredibly reliable and exceptionally flexible. They are very professional and have forged a genuine bond with our dog and makes us extremely comfortable in knowing that he enjoys his daily walks and that they treat him as one of their own. We would have no hesitation in recommending Fullers Ark to others and have done so to all of our new dog owning friends."